I’m chomping at the bit to get to the allotments, but every time I have enough time the wind picks up for a few days and it just doesn’t feel safe enough to sit down and get lost in thought. Allotments are places where many things blow around and sometimes when it gets really gusty, as it has been, there are various greenhouses that have suffered glass broken and shed doors are blowing open. It’s just not the right place to sit still and draw, not to mention being impossible to control sheets of paper. Finally there’s a calm day when I’m free and I head up to the allotments - through a hail storm. March certainly throws weather at us. However once I arrive the hail has stopped and the daffodils by the front gate are catching the sunlight. The big news this month is that the water is back on. The weekly delivery of chippings helps plot owners to tend to the paths and as they do so and some work together to help neighbouring allotmenteers the place is alive and so different from a month or so ago when the snow arrived! I stop off on my way and chat about the nesting box on Q6 which doesn’t have tenants. However a neighbour is lending a hand to lower the height of the holly, perhaps that will make a difference. To my untrained eye a nesting box in a holly bush is a perfect deterrent from intruders. As I collect my sketching stool from the shed another hail storm passes by, tapping out a tune I don’t know on the nearby metal table as I cower inside the shed until it soon passes. As I paint that day a cat saunters past, they are too quick for me to catch in my sketchbook though, by the time I’ve put down my paintbrush and got out a different sketchbook, the feline friend has hidden itself amongst the leaves of a neighbouring plot. 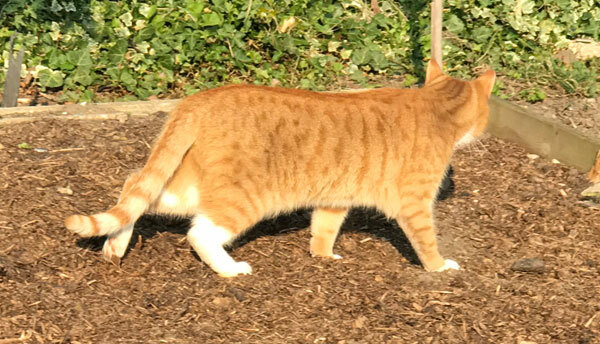 A cat saunters past in the sunshine, ignoring me as I sit quietly. The allotments are just so alive with energy and activity, there is so much tidying and pruning and planting going on, unwanted crops dug up and used as ballast or composted, from above the plots must look as though they are awash with busy ants this Sunday. As I’m drawing the rain starts and I shelter in a greenhouse I’ve been given permission to use. The roof keeps the rain off but the recent gales have broken some of the side pieces. It is however, welcome respite from the now pouring rain. We have experienced so many weather systems today it’s hard to know what might come next. Eventually I give up on the day and a little too cold for comfort I head home to warm up. Leaf catcher, otherwise known as a sieve! This Sunday visit the weather has treated us to sunshine and warmth. I wander around the plots and can smell the wonderful scent of cut grass. It’s just gone 10am and allotmenteers are out in their t-shirts, working hard, it feels as though spring is creeping into the corners and I spot blossom on some trees. It’s impossible to come here and not feel an overwhelming sense of wonder at nature. I’m here to meet and chat to Q6 today, but before we meet for our lunch, I head onto plot O7A to do a little more to my page of drawings from the plot. 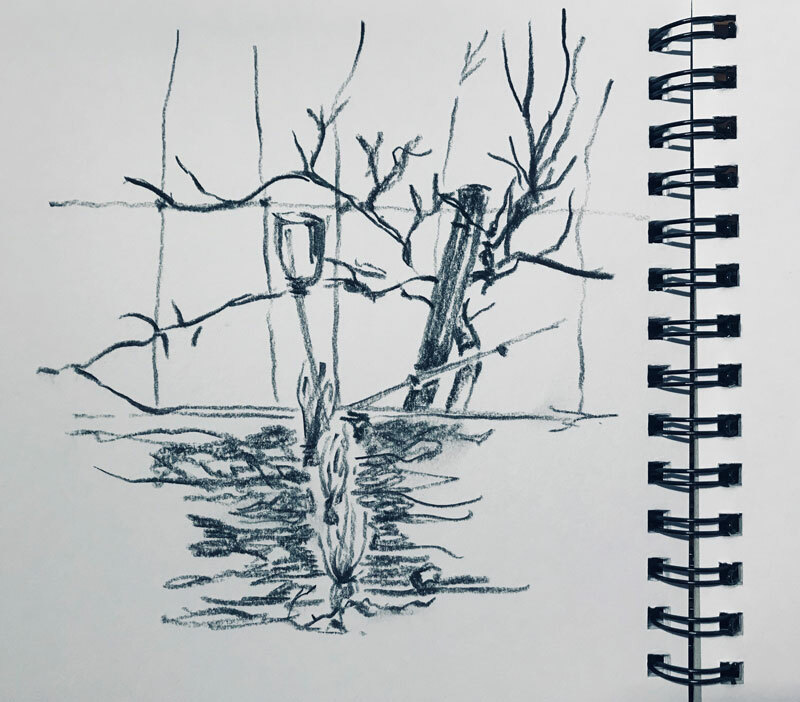 As I sit by the pond and draw the willow the sun’s power surprises me, very soon my winter layers of clothing disappear and I’m in a t-shirt, feeling strangely bare without a scarf and gloves. It’s also hard not to sit and close my eyes, but I’m here to draw, at least this morning, I remind myself. We boil up some tea and sit at a round table with two chairs, talking about the plot, the person and life in general. This is a very special moment for me, the unbidden memory of sitting with my grandfather at his allotment is very strong and catches me a little by surprise. The friendships and generosity that people have shown me during the residency is very moving. Finally I leave and head back to put my chair away only to stop and talk to another friend while she’s eating lunch and I have another brew. I may have to review which days I come up so that I actually get some work done and don’t get swayed with offers of tea and chats, or at least not too often, I’m easily persuaded when it’s warm and sunny. The breeze picks up as the temperatures cool, a sharp reminder that’s it’s spring and evenings sitting outside are still some way off. Standing in the greenhouse now, I watch as potatoes have their soil built up so they almost cover the plant. Seeds of various kinds are being sown as others are being potted on, keeping a cycle of growing. On the constant lookout for slugs, which can quickly cause a disaster in a greenhouse with all those lovely new tasty shoots… one is spotted and it doesn’t last very long. I’m given some glorious looking salad leaves to take with me, coriander and rhubarb which makes its way into a rhubarb and strawberry fool for Mothering Sunday. 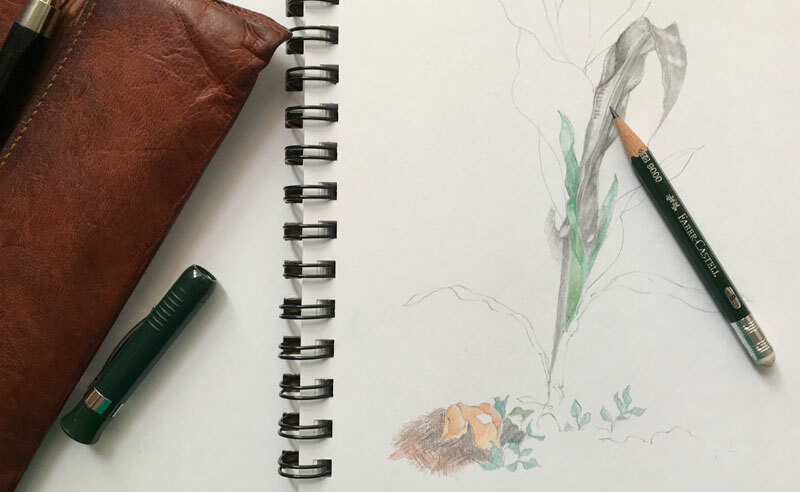 Friday, people are around but it is still peaceful and the weather is like a summer’s day so I settle myself quickly in to a position to draw, which is where I end up for the next six hours, barely moving other than to slightly shift to draw another plant. Although there’s someone working in the plot next to where I’m sitting this one feels hidden away and that suits me today. Today is an introspective day, a quiet day, one where I just want to sit and draw which is exactly what I’m able to do in this glorious weather. I am joined on the plot by a scarecrow but other than a slightly rustling bag over her arm, and it is a her I think, as she has beautiful long blue plaits for hair, she doesn’t move so I’m not disturbed. The smell of a bonfire drifts over, I’m not sure if it’s on the plots or from one of the houses, I can’t see the smoke, just smell the scent of burning wood. Again I’m taken back to nearly 50 years ago and cooking baking potatoes in the fire pit in that small allotment plot of my grandfather’s in Switzerland. Planes fly overhead to exotic places but I’m not drawn to wonder where I’d like to go if I could go anywhere, because I’m pretty sure I’d just pick here. A light dusting of snow on the allotments has then frozen over making the paths crunch underfoot. The sky is a solid fearfully cold blue which requires the wearing of many layers of clothing, with more in my bag. However the snow is deceptive and as the sun burns through the day warms up. I’m being interviewed for the Ham & High today and as we talk on Q8B we drink freshly brewed coffee and chocolate ginger biscuits laid out on a tablecloth of ice. After the interview I’m left on my own and carry on drawing as the sound of ice cracking on corrugated plastic shed roofs accompanied by the constant dripping of melting snow, along with two magpies squawking. As soon as the sun disappears the temperature drops I realise my feet becoming very cold and I make a hasty retreat to my warm home. As I arrive today the wind brings a cold twist tucked inside it which holds on to your ears, nose and fingertips after the powerful wind has passed on. But between the swirls of this mischievous petulant wind which catches the clouds, the sunshine bursts through on J4B. This on/off winter sun is difficult to work with as shadows come and go not only on the ground but also on my paper. This plot is exposed so there’s no hiding from the wind when it comes, no shed to befriend its lee side. I am so wrapped up it takes a few minutes to realise a there are some drops of rain. With no where to hide I hastily clear up and by the time I’m all packed away the wind has blown the rain somewhere else. I’m battling today though, though a head cold and sitting in this spot is rather chilling so I head back to my writing spot at the rusty table elsewhere on the site. Making some notes and now out of the wind with a cup of tea, I feel less chilled continuing to write until the lack of light makes it impossible. Walking slowly back on the dried leaves I tune into the sound of the birds. They are busy in conversation as the sky turns to dusk. Finally I have to give up writing as the light falls away. I’m late to the plots this afternoon but I manage to get on to F4, even if it does mean turning down the offer of tea from a plot I pass which is a shame. I aim to draw a large explosion of leaves but once again I’m caught up in the detail of an artichoke leaves and some dried seed heads. At this time of year instead of the summer’s vibrant colours everything is muted, soft greens, greys and silvers. As I sit and draw in my quiet undisturbed world I become aware of the noises that surround me. No need for a hat or scarf today! I’ve become accustomed to working on my own and only seeing one of two people around each visit. However I’m aware this time work is going on all around. Someone to my left is hammering on their plot, someone to my right is pruning a fruit tree. Dogs are vying for attention in the houses that surround the plot (answered I think by a dog on the allotments) as magpies and parakeets shatter the soft air above. As dusk starts to amble in it’s noticeably later and slower than previously visits. The dogs have all gone inside and quietened down, most people have left and it’s time for the quieter birds to be heard. Before I leave I sit having a last cup of tea from my flask and a wave of contentment settles over me. Although I have a small urban garden there is something special about the space of an allotment, for me this one is the countryside within a town, where the pace of life is no longer influenced by advertising and trend but where nature dictates. I arrive at the plots which are sparkling in glorious sunshine. It’s unseasonably warm and I can’t wait to draw. However I bump into a plot owner who invites me to join them for a coffee which is such a lovely sociable thing to do and I have time today so I agree. It turns out to be such a treat as they have many photographs of a previous tenant who I have heard so much about. The personality of Margaret and her friendships with people seem to have become part of the soil here and I have heard so much about this wonderful lady that when I am shown a video of her talking about the plots it is a treat to be able to put a voice to this wise and wonderful gardener. I haul myself away from the lovely sunshine and chat to a plot where there’s a lovely mixture of new and old. A bucket of twigs and branches holds last season’s offerings but in the beds of winter flowering crocuses are a treat for bees and wasps enjoying the warmth and in another bed seedlings start to force their way through the ground. I’m sitting near a tree with many bird feeders on it and there is a constant flow of small birds visiting, playing in the branches of the trees, their chatter like a playground of young children. What I think is a crow, appears for a while and finally makes its way down to a feeder, it’s not as elegant as the smaller birds but still somehow regal with its muted black feathers. As I talk to one of the other plot holders there is a sudden rustling and charging through the plants on plot to our side and then a beautiful young fox appears seven or eight feet away. It literally glows in the low sunlight and then is gone, out of sight, so quickly I momentarily wonder if I imagined seeing it. There’s another fox nearby but it doesn’t appear, then the noises stop and their game of hide and seek is no longer close enough to hear. I head home wondering just how many foxes there are that visit this plot, is it just a playground when they aren’t rummaging though the food rubbish of nearby dustbins. Today the sun is baking down, it’s like a warm spring day, bonfires are crackling as they get rid of unwanted waste, pruned twigs and branches, there are many plots being worked on, the allotments are alive with activity, but no one really believes that this good weather will last and everyone’s aware that a frost could still be lurking around the corner of March. I have arrived with far too many layers and although I’m sitting still and drawing which usually means I get cold, today I’m finding really rather warm in the sunshine in my long sleeved t-shirt, how different from just three weeks ago. The plot I’m on today is close to a main path so I catch up with people as they head onto their plots and then on their way home. Someone has come to finish of a pond so that they can encourage frogs, which have appeared in some of the small ponds around the site. The sounds of chatter and laughter from the allotmenteers trickles over and I remember how busy summer was, it feels like years ago that I started this residency not just eight months. As this pretend spring day gets ready for an early night the chill soon spreads over the ground. Appropriately for February as the sun sets the tree branches play with its shape and form a heart. Month seven and well, brrrrr! 4th January 2019, my first visit this new year. It’s 1pm and the sky has a few wispy clouds floating high above against a pale blue sky. Long shadows lie on the ground as the sun is already heading quickly towards the horizon. 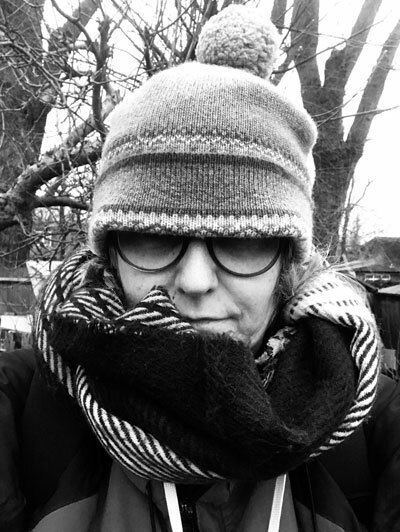 Although there’s barely a wind it’s cold and I’m wrapped up in my hand knitted jumper my mother made, it’s thick, very thick, warm and cosy, which along with my waterproof jacket, scarf and fingerless gloves allow me to sit for some time and draw. Unlike the allotment holders I don’t move around all the time so therefore cool off very quickly when sitting almost motionless, drawing. As the sun lowers I add a woollen bobble hat to this delightful ensemble, being at the allotment really doesn’t allow you to be fashion conscious in any way, it’s necessity over whim. I meet someone who tells me the plot number he’s been working on in such a way I am completely confused, until I realise he’s romantically read the number as a roman numeral rather than a combination of letters and numbers. Layers, it’s all about adding layers to keep warm! There aren’t many of us around, N6 is clearing brambles, sad that the council feel the brambles which are the home and playground of many local birds need to be removed or at least thinned. It’s a difficult balance between having a nature space and a neat space, not everyone feels the same or has the same boundaries. Being Swedish we talk about how the Swedes like to spend as much time as possible outside and how she loves being outside in Winter. It isn’t something that I particularly thought about until I started the residency and how much I’m enjoying having a reason to go out rather than hunker down inside in the warm every day. We also talk about the delightful warmth and respite from wind that a greenhouse can give on a bitterly cold day. The water has been turned off for winter so that the taps and pipes don’t freeze. This means I need to be organised and bring painting water with me. I have started a visual weekly journal, picking out details from a different plot each week. For this purpose I will use the German watercolours I have made with natural dyes; carrot, extract of vegetables, blue algae, beetroot, all feature in the palate. They aren’t high grade watercolours and can be a bit tricky to get depth of colour, but for my journal they are perfect and to be using natural dyes in the allotment work seems completely fitting. By 3pm it’s too cold for me to draw any longer though so I leave. Just as in the height of summer, I find there is so much to draw here in winter. The sheds are exposed and structural patterns are dominant, where they will soon become grown over and hidden. And at this time of year the blue skies can be cold but wonderfully uplifting after solemn, short, grey days. Being outside is a good mood uplifter, just walking around the plots and spotting small shoots breaking out of the ground is so exciting. But it can change really quickly as well and having settled into a plot to draw the journal I find I’m anxiously checking the sky that has clouded over and is threatening rain. I’m sure a few drops land on me, so I move as near as I dare to a holly tree, and from that close position notice a bird box hidden against the trunk. A perfect place that won’t be disturbed by anything big enough to be speared by the sharp edged leaves. Completely lost in my world of drawing I hear a gentle crunching as an allotmenteer passes behind the plot, we wave and say hello and shortly afterwards she offers me a chocolate Brussels sprout which I can’t resist! It turns out that we have a small Swiss village in common, her cousins and my mother grew up in the same village when I check with my mother there’s a chance they were the neighbours that lived opposite! I love talking to the people at the allotments, they are a wonderful mix of cultures, experiences, jobs and personalities but with a common golden thread, a love of growing and nature. And you have to love it as it is just too hard to keep a plot unless you really enjoy the work involved. She returns with a skeletal poplar leaf as a late Christmas present for me! I’m delighted and will take it home to sit on my studio table until I have some spare time to draw a detailed study. By 4:20pm the light has faded so much I have to leave and head home to warm up in a hot bath with a cup of tea. Beautiful hellebore and rain doesn’t stop play! I’ve got really cold today, without realising. The last half hour as the light faded the temperature must have dropped but I was so engrossed with my journal and drawing I didn’t notice. My fingers and nose are really cold today whereas it is usually my feet that tell me they’re getting uncomfortable. I’ve been working on a hidden plot, one that’s not obvious from the main paths and one that has hidden treasures. 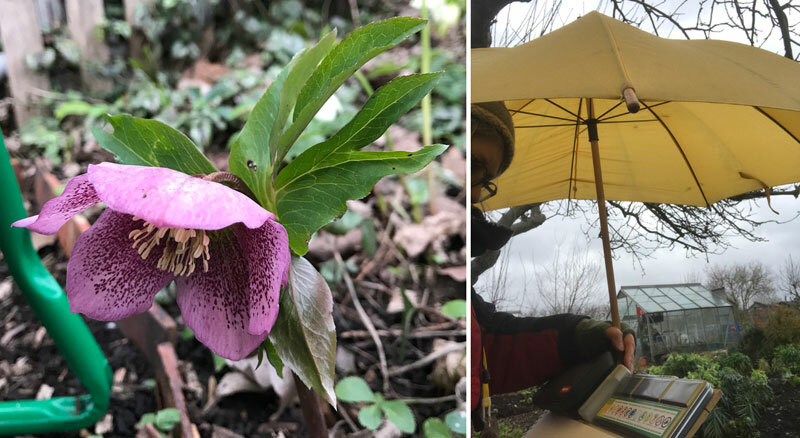 Unlike a lot of the plots within the boundaries, that are in a state of semi hibernation, this plot has a wonderful selection of plants, some with small white flowers (my plant recognition is not improving, neither is my bird call recognition,) and a beautiful selection of hellebores. It’s raining but I’m not easily deterred and carry on while trying to hold my drawing board, pencils and paints while balancing an umbrella on my shoulder. With the carefully tended paths this feels just as much a winter plot as a summer one, which is how although the light has been sinking I have become completely lost in my work. An empty snail shell lays on the ground, a forlorn home, decaying, disintegrating. I nip into a shed I’ve been given permission to use and write up my notes for the day while there’s still a tiny bit of light left. Bright green parakeets which are not a favoured bird of mine, sit in surrounding trees. They are brash and noisy and overshadow the delicate colours and birdsong of the more native birds. Eventually they too move on at the end of the day and I’m left listening to the sound of plastic sheeting flapping in the wind and plastic bottles rattling on top of stakes. Eventually the light blurs the edges of shapes as it starts to give up on its day. Jays, or is it Magpies, squabble in the tree to my left. It’s Tuesday, 10am, I’ve only spotted one other person, somewhere there’s a creaking shed, and nature is already discarding its leaves. I’m back on Y1B, capturing the plot on paper, from one day to the next the leaves move, grow, droop, twist, bend and fall. I know I’m sitting in the same place, but I struggle to see what I drew before. I’m away for a week housesitting in Cornwall. It rains, a lot, after the summer of dry blue skies. I’m missing the allotments more than I thought I would. I’m not in a city, there’s an expanse of sky over the water, I usually love this vista and never want to leave, but the allotments are calling me back. I feel I’m missing all the growth and change by not being there at least for a week. I’m in charge of checking some small seedlings while the plot owner is on holiday. I find myself talking to them very quietly, and to the snails that I then whisk away to another life in different part of North London. I know these little creatures have excellent homing instincts but it’s going to take them a while to get back. I carry on my lookout while drawing Swiss Chard. O6 and I enjoy a flask of tea together, sitting at the table, glorious sunshine, hats on. 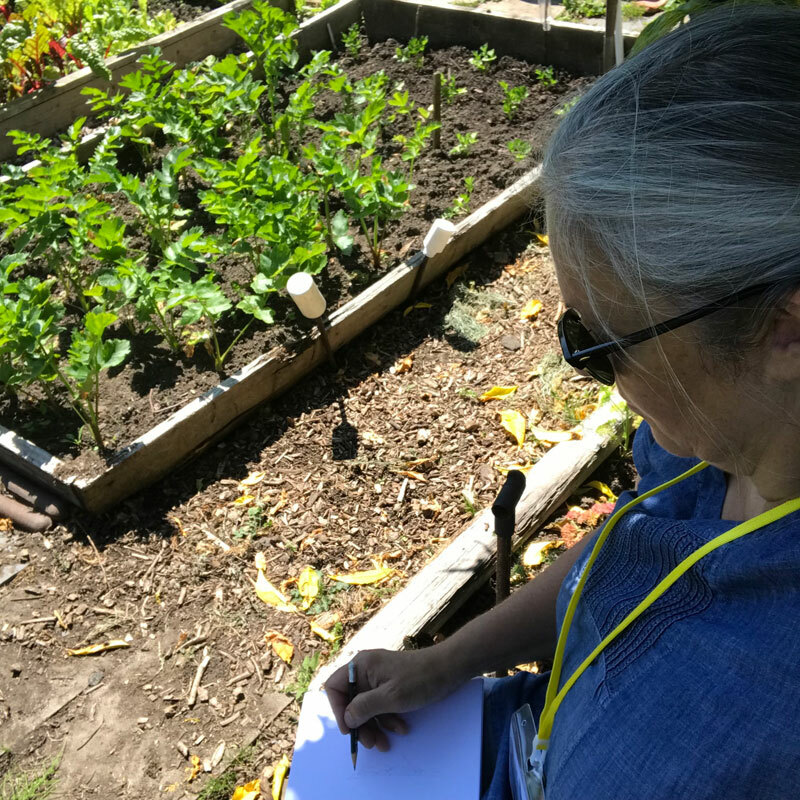 We can’t sit still for long though, as the conversation meanders around the plot we’re jumping up to inspect more closely something we’re discussing. Two cucumbers, about two foot in length are cut, tomatoes, chillis, dahlias, aubergines, strawberries, all part of today’s crop. I don’t turn down the generous offer of tomatoes, a few of which don’t last the journey home, they’re so deliciously sweet. We’re just about to get going, I have my drawing materials in my hand when the heaven’s open. Quick as a flash everything transfers to the shed’s inner sanctum. This is the first time I’ve had to resort to waiting out a downpour in the shed, I’m ever so grateful that I’ve been lent a key, it’ll no doubt be my saving grace this winter. It pours, the aroma of wet rain on the plants is all consuming, deep, deep breaths. I could happily wear a perfume called ‘after the rain’. Scents are intensified, the soil reaching up to touch the sense of smell. The joy of rain after heat. The sky is still black so I don’t venture far as I’m not prepared for wetness today. I sit just outside the shed, hunkered down out of the way, starting to record pears on a tree. Soon, the sun returns and bakes my back again. Flies and insects scuttle and buzz around me. One hungry wasp sits on top of a pear, twisting and turning in a hole, oblivious to me as I lean in to take a good look. Autumn has breathed its freshness over the plots today. The sun is behind me, it’s 6pm, I have a cardigan on for one of the first times this summer. A cotton scarf I’m wearing matches some dahlias, exactly, it’s not often shocking pick is a camouflage. The coolness is refreshing and the unworkable heat of just a couple of weeks ago feels like a fading memory of a summer holiday in a different country. A robin hops around in the sweetcorn bed to my side. As I work I become aware that I’m feeling cold and my hands are icy, it’s been so long since my body has experienced this that I sit for longer enjoying the feeling. Laughter trickles across the plots from one to the south of where I’m sitting, joyous laughter. I arrange to meet E2B at 10am. We time our arrival perfectly and walk through the gates together. We sit and chat and the frustration they arrived with ebbs quietly into the distance as we recount funny stories and end up crying with laughter together. That’s what the allotments do, they heal, they take the experiences from outside and they gently cleanse them away. It’s a joy to sit and talk, it’s easy to talk profoundly in this space, it feels protective. I watch wasps on the ground going mad with joy at fallen fruit, so much to feed on. E2B has to go and I carry on sitting at the plot, drawing. It’s quiet, having taken a time for people to filter through the gates this morning. A few hours later I go to leave and see an allotmenteer who has been working hard all morning relaxing in a chair, in the sunshine. Month two and it's hot! I’m choosing my time carefully at the allotments. I’ve managed a few full days, but it’s been easier to work in the evenings when the temperature isn’t so scorchingly hot that my watercolours, painstakingly mixed, dry before I’ve had a chance to put them onto the paper. There are clouds in the sky and at last a breeze. I place myself on the edge of a main path and started drawing. However, the sun being on its decent, is moving swiftly and the light changes every few minutes, which brings its own challenges. Two jays croak and cry their call while I can get completely lost in my work, again. I often forget I’m in the centre of London here, until from the south west, a helicopter’s rotor blades rhythmically slices through the peace and quiet. The breeze picks up and all of a sudden things come crashing down around me onto the path. I hesitantly turn round just as there’s another gust and suddenly the culprit is obvious, the bark from the tall London Plane trees that line the fence is falling off the trunks and tumbling down to earth. It’s 10:20am Saturday morning. I’ve spotted one other person here so far, watering their plot, otherwise, there isn’t a lot of activity, yet. My plan is to start understanding the plot boundaries, I pass forlorn apples that have dropped onto the ground to the utter glee of wasps, I see lavender awash with bees and butterflies. The plots are a bit of a maze as I wander round I meet more people. I talk to J2 and I am cut a marrow and donated beans. I’m going to be torn between painting these beautiful vegetables and cooking them. If I’m lucky I’ll have time to do both. I sit with E2B for a while discussing the history of their plot, the process of getting the plot and how they tend it, every snippet told is fascinating to me. I am watching jam being made with gooseberries grown at the allotments, I learn and record the process. Intending to make it into a little artist’s book. Saturday evening, clouds scurry by for, what feels like, the first time in weeks the rain has fallen and the temperature has dropped. The wind that steadily whips across the plot bring coolness. Clouds have turned a threatening grey and the heat that was so unrelenting is already slipping into a memory. The sound of a breeze through leaves that edge the allotments, airplanes and distant sirens slide through when a momentary respite of the more playful wind allows. It feels and smells very different here when the heat isn’t baking the earth. I am reminded of a new word I recently learned, Petrichor, ‘the pleasant smell that frequently accompanies the first rain after a long period of warm, dry weather’. This Saturday evening it’s quieter, people walk along the path at a faster pace. 11am Saturday, I see only three people on plots but I hear so many more, rustling amongst the leaves as yet another promise of a hot day is borne out. I find dappled shade in the corner of Y1B. I throw fashion to one side and wear a hat I mistakenly bought a year or two ago. Again tucked away in the corner I can draw and paint undisturbed, thinking of nothing more complex than trying to identify the birdsong I hear. Small plums drop from a tree is sited in the garden next to the allotments and which hangs over. They scatter around me. As my arms become sticky with sweat flies on them, cabbage white butterflies float past and ants crawl over my pencil case. When the breeze picks up the plastic bottles sitting on top of the bean stakes dance and play their own tune. I’m back on O6, this is my bedrock plot, I know O6 well, to every question I am given plentiful answers, to every query I am given history, to every rumble of my stomach I am given another fresh tomato! It is also where I leave my gardening/drawing seat and makeshift drawing board so that I don’t have to bring it along with me every visit. Today I sit in front of an espalier apple tree. Hidden by trees children play on the plot behind, dipping in and out of water excitedly, squealing with delight and mock horror at spiders and bugs, trying to frighten one another with ever increasing large insects. O6 and I eat tomatoes warmed by today’s sunshine from the greenhouse while we take a break, there is nothing sweeter, more delicious, more fragrant than freshly picked fruit, particularly tomatoes from the vine, eaten seconds later. The day after I return and head to X2 where I sit in the shade of a quince tree on a bench. I’m visited by wasps, flies and Harry, an elderly chap with a personable character, a mongrel who has been sitting on G5 but meanders over to see who I am and if approved of. I didn’t realise how grateful I would be when first offered the use of chairs and benches by plot owners, although I have a drawing stool a bench offers me space to sit and put my paints and pencils down. And a back rest is sometimes a bonus. Harry sits next to me and his owner appears. I learn how and when to prune soft fruit trees, as I am handed a greengage and although it’s incredibly tempting to eat, I must take it away to draw first. Shortly afterwards I am offered a fig straight from the tree, when I say this also has to come home to be drawn first I am offered a second and sit in a delicious dream as I eat this sun warmed fruit. With less than a minute from plot to palette its sweetness seeps into my very being. Next I am delivered a perfect shaped aubergine, but as this is going to be X2’s supper I don’t get to take this one home! I need to record this perfect specimen. I am frustrated and challenged by using watercolours which dry too quickly for me. I battle on, and work with pen on top of the watercolour to bring more structure into the piece. I return the aubergine to X2 and I am handed a number of windfall cooking apples which I cook up that evening. As I turn to leave we spot a sparrow hawk swooping into the tree on the allotments’ boundary. Arriving on Y1B the kettle is on and we sit to discuss the plot, I ask pre prepared questions but the conversation flows its own way and it is obvious that along with the other plot holders I have spoken to, Y1B love their plot, from the produce they grow to the sanctuary and happiness that comes hand in hand with the hard, but rewarding, work. I return to O6 and am met by my new eight year old friend from O7A. She is interested in my drawings and paintings which I show her and we head off to her plot to draw together. I am on my stool, she on a chair beside me, while her four year old sister sits beside us, surprisingly quiet, watching. 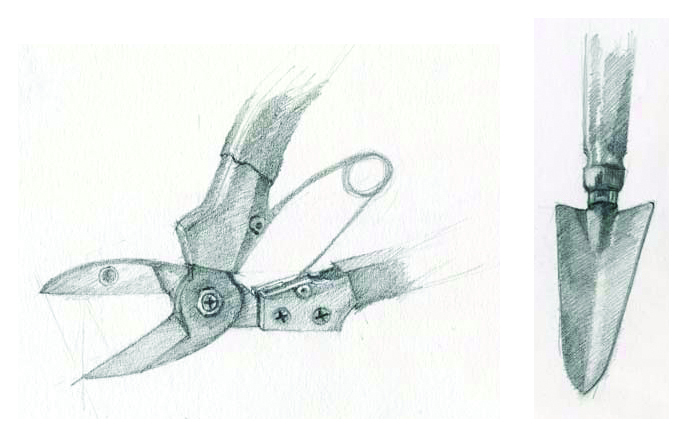 As her parents work on the plot we start to draw a rhubarb leaf together, the same leaf from different angles. We talk and work on our drawings discussing the leaf shape, marking out an outline shape so that we can correct it as we realise that elements are the wrong angle or in the wrong place. We both have our diagram and begin to draw detail, looking and studying together. She asks me questions about the leaf, how to draw it but she actually needs little help from me just the occasional piece of guidance. I look over to her drawing, there is such sensitivity, and such careful drawing I am delighted to sit and watch for a moment. 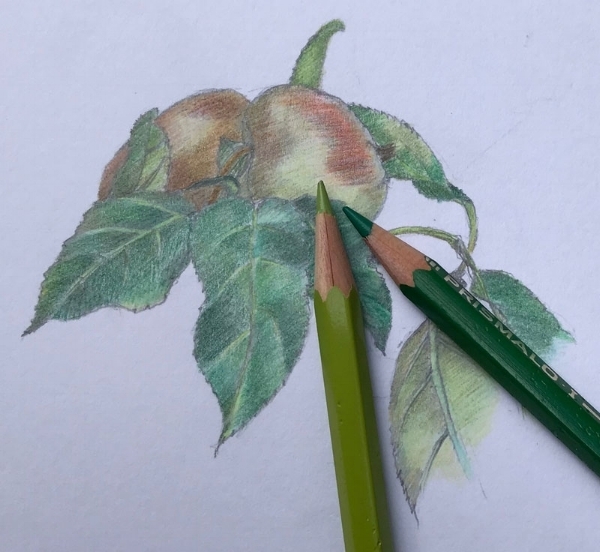 We both work with coloured pencils, before starting to use colour we do a little work on how to merge colours, using blue and green to produce a darker, deeper green, and yellow and green (or blue) to produce a lighter, brighter colour. We also work with the weight of the pencil, lightly to let more of the white paper shine through, and heavily which covers the white paper to give a darker feel. Drawing together I have completely lost track of time and soon it is time for the family to go. My plot drawing partner finishes her piece, although I suggest she doesn’t rush it her enthusiasm takes over and she is determined. I meanwhile leave mine officially ‘unfinished’ but in a state that I am happy with. I like drawings that don’t appear ‘finished’, they lead the mind to fill in and explore what’s missing. It’s a technique I sometimes use through choice. I am really impressed by the drawing of my new friend, she has worked hard and conscientiously and has produced a drawing she can be proud of. I’m sure I have gained as much enjoyment from this experience as she has, we hope to do it again. 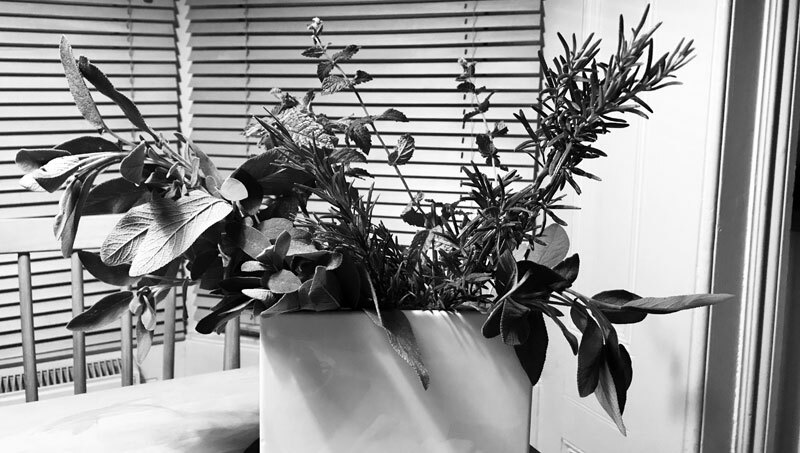 As I walk away into the evening light I am handed a beautiful bouquet of herbs, fresh mint, sage and rosemary, a wonderful gift. I’m sitting on an old wooden chair on O6. Hiding from the blistering midday sun in the shade of the tree. She’s growing veg and that’s what I start drawing, but I have no idea what vegetables they are. In the distance the usual city backdrop of sirens carries on, but here, in this space, it’s calm and peaceful. There’s a rustling as a light breeze plays with the leaves while insects and butterflies silently flutter by. The sky is blue without a cloud, so no momentary respite from the sun. Just like in my garden at home, there are old sash window weights by the side of the plot. I’ve kept ours because they look so useful, but whatever that use is has escaped me, perhaps I’ll find out what it is here. The smell of hot sun baking the earth is so reminiscent of my childhood that the memories of my grandfather working in his allotment, memories from about 50 years ago, come flooding back. The heat on the earth has its own special scent. I wished my grandfather and I had shared a common language, we used basic sign language and smiled at each other a lot, but we also spent companionable silences together on his allotment. If we’d shared a language I probably wouldn’t be sitting here unable to identify what it is I’m drawing. The bright yellow cord of my lanyard is attracting a number of little beasties who find the vibrant colour irresistible. A white butterfly and bee drift around me, but soon realise I have nothing other than perspiration to offer in the way of food. As they work away to their own timetable, mine slows down and relaxes. This is the perfect place to be to draw, I can lose myself in spaces and feelings like this, lose myself in the drawing, become completely in tune with the moment, what I’m doing now, and nothing else intrudes on that feeling or space. 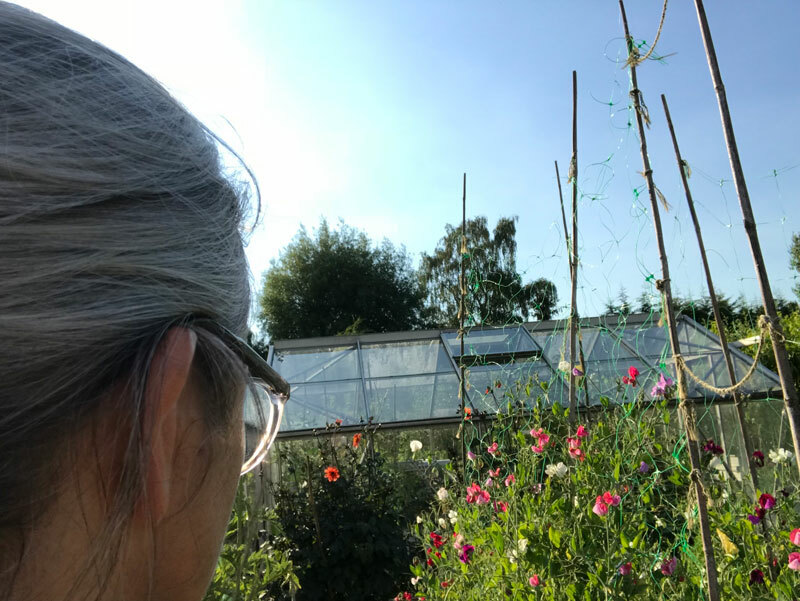 It’s not often I’m able to work like this, without interruption or my mind wandering, so it’s very special to find that I can tune in so quickly to that feeling at the allotments. As I draw and time passes I’m beginning to realise what a formidable task I have ahead of me. I could easily become overwhelmed by the numerous things I want to draw and the season won’t last long enough for me to record everything. I could spend a year just drawing one plot, watching, sketching, recording growth and then decay. The sheds and signs intrigue me, but that’s definitely a subject for winter. The patterns of raised beds and rows of different leaves are beautiful. And as I contemplate this, the metal end of my pencil has become so hot it’s difficult to handle. Another visit, in the evening, it’s still hot but there’s far more activity on the plots. The trickle of water is everywhere, surrounding me as people arrive to hydrate the earth. I’m sitting down, between artichokes and sweet peas, I can hear the allotment near to me on the left as it’s being irrigated. The pattering of water on leaves. That doesn’t stop numerous insects from landing on my arm and probably drinking jewels of sweat. Drawing sweetpeas during my Artist in Residence at Highgate Allotments Association. Working in real time. I’m one of those people that find I need to take some time to wind myself up ready to talk to a lot of people. I’m not naturally outgoing, I’ve been described as a public introvert and a private extrovert and that feels like a good description. But, sometimes we just have to put ourselves out there and be brave and determined. I thought the annual allotment BBQ would be a good opportunity to show my work and introduce myself and my project to the allotmenteers. It’s always a little disconcerting to put yourself and your work on the front firing line, nothing between you and unusual comments you don’t have a ready answer for. When an artist puts their work that they’ve spent hours working with on public display, it’s like putting your inner most secrets on show. 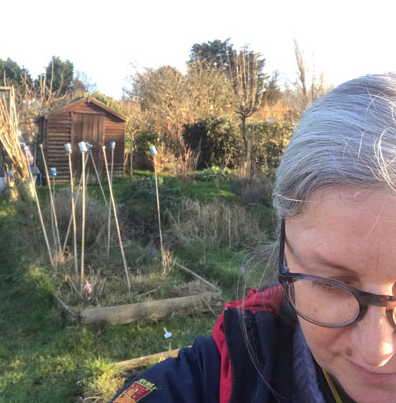 However, the allotmenteers I met were generous, many had read the newsletter and knew that there was a new artist in residence, so were ready to impart useful information, history, stand with me and chat. Those that weren’t aware of my residency were equally welcoming and interested to listen to my explanatory chat about my plans for the next year. I couldn’t have hoped for a friendlier audience. Conversations were incredibly varied, there are so many different personalities, backgrounds, jobs and interests that are drawn together in allotments. It’s so exciting to find I have this ready source of fascinating information in this space. One person offered to help me identify the botanical names of plants, but I had to own up I was struggling to identify the common names so that was perhaps going to be outside of my remit and requirements! I even get a chance to talk to someone about my Bay Leaf Curl at home, but they didn’t have any folklore remedies to help me. As the smells of the BBQ drifted towards my table by the shed, a plate of cooked vegetables also drifted over, along with a glass of wine. There were so many gestures of friendship and kindness in my day, I was moved by the generosity of spirit. 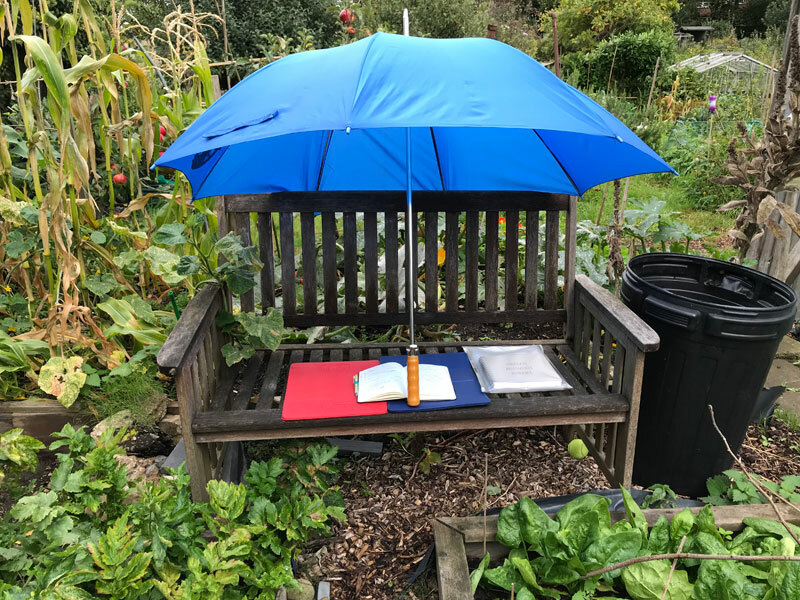 However even with a parasol I was finding the heat somewhat oppressive and regularly moved my table with work on, to hug the shade of the shed, with the occasional breeze attempting to play with my work and whipping away one or two of my artist’s books when I wasn’t keeping a close eye. As the afternoon turns into the early evening the BBQ packs up and I see baskets full of stunning home grown produce and flowers, walking out through the gates. All of these I’ve missed a chance to draw!